We grow and sell Paw Paw Trees in these sizes: Starter plug, 1-Gal, Full Gal, 3-Gal and 5-Gal at various times of the year. These Paw Paw came in as seedlings and were set up into 1-Gal buckets in spring of 2013. Beautiful unique blooms and interesting fruiting ability. The fruit on this tree is very similar to a banana and taste very similar as well. 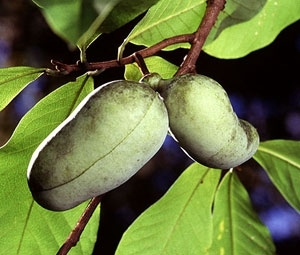 The Paw Paw tree falls into several different categories because of its fruit as well as its massive size. The Paw Paw tree can reach heights of up to 35 feet and reach spans of up to 30 feet. It provides lots of shade and does well in many different types of soil and areas. Zones 2-11 Although better fruiting has been noted in Zones 5 up. Young trees thrive better grown in shade while fruiting is better in full sunlight. One might grown young trees in buckets through a 5-gallon and then plant them in the ground in full sunlight. They both grow and produce better in areas protected from the wind. When planting trees, allow 8 feet (2.5m) between them. Water newly planted trees immediately after planting, and as needed throughout the growing season. 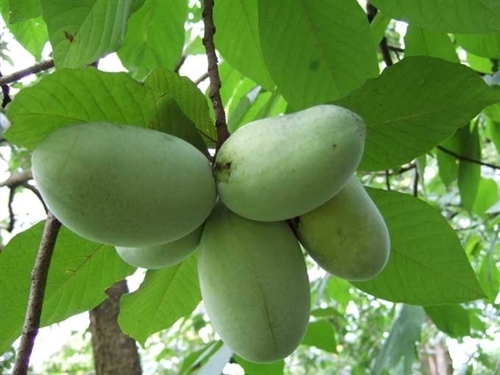 Pawpaw trees require adequate soil moisture, especially in the first two years after planting. Transplant shock may be reduced by providing temporary partial shade to newly planted trees. Application of a balanced fertilizer (20N-20P-20K) every few weeks during the first half of the growing season may also improve growth and establishment of young trees. Pollination can be a limiting factor in pawpaw fruit set. The flowers are protogynous, meaning that the stigma (the female receptive organ) ripens before the pollen, and is no longer receptive when the pollen is shed. Thus the flower is designed not to be self-pollinated. 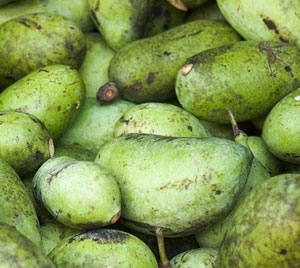 In addition, pawpaw trees are self-incompatible, usually requiring pollen from a genetically different tree in order to be fertilized. Finally, the natural pollinators of the pawpaw--various species of flies and beetles--are not efficient or dependable. 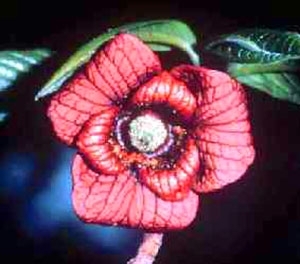 Although it requires a little extra labor, hand pollination to ensure fruit set can be well worth the effort and can be done as follows: Using a small, flexible artist's brush, transfer a quantity of fresh pollen from the anthers of the flower of one clone to the ripe stigma of the flower of another clone. Pollen is ripe when the little ball of anthers is brown in color, loose and friable; pollen grains appear as yellow dust on the brush hairs. The stigma is ripe when the tips of the pistils are green and glossy, and the anther ball is still hard and green. Do not overburden the tree with fruit, as this will stress the tree, resulting in smaller than normal fruit, and may cause limbs to break under excessive weight. Plants will be sent bare root for ease in shipping. In the fall through winter in extenuating circumstances our plants may arrive without leaves, attached or lose them soon after arrival depending on the amount of stress they are introduced to during shipping!! If this occurs please, plant as normal, new leaves will form within a week or two with proper sunlight and water.